"Post-Tib" Tendonitis or "Tib Post" Tendinitis, is the term given to any inflammation to the posterior tibial tendon. Due to the large amount of force that goes through this tendon, the most common cause of tibialis posterior tendonitis is over use and injury. Over use leads to inflammation of the tendon, which over time can often lead to degeneration (tendinosis) of the tendon. 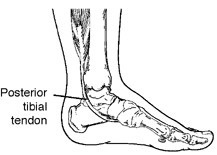 The Posterior Tibial Tendon runs along the inside of the ankle and attaches to the foot under the medial arch. The posterior tibial tendon can be especially prone to tendonitis as it helps to maintain the arch of the foot and prevent excessive flattening (over pronation) of the arch while walking, standing or running. The posterior tibial tendon starts in the deepest portion of the calf and runs behind the medial malleolus (the inner ankle bone). The tendon continues along towards the foot and inserts into multiple locations on the inside and the bottom of the arch. With each step, a tremendous amount of tension and stress is placed on the tendon as it helps to maintain the arch of the foot. Progression of Posterior Tibial Tendonitis to Posterior Tibial Tendon Dysfunction. Posterior tibial tendonitis can be a precursor to Posterior Tibial Tendonosis (degeneration) and then Posterior Tibial Tendon Dysfunction (where there is progressive loss of strength in the tendon and a progressive flattening of the arch as the tendon degenerates and lengthens over time). Years of over-pronation (flat feet) or biomechanical abnormalities (such as a medially deviated sub-talor joint axis) can lead to the progression from Tendonitis to posterior tibial tendon dysfunction. This usually occures when there is too much stress on the tendon than it is able to deal with. With new cases of posterior tibial tendon degeneration and inflammation, the pain and swelling may come and go quickly, but eventually the problem may become more permanent/chronic leading to dysfunction. 1 - Posterior Tibial tendinitis: usually short term after an injury, tear or when the pain in the tendon first occurs. 2- Posterior Tibial tendonosis/ tendonopathy: when the tendon pain has been present for some time and the tendon becomes painfully degenerated. At this stage it is often no longer inflamed unless it is re-injured. 3- Posterior Tibial Tendon Dysfunction: when the damage is so severe that there is lengthening and degeneration of the tendon, accompanied by strength deficit. Post-Tib Tendonitis occurs when the muscle is overused and its tendon is strained. As tendonitis is an inflammatory condition, posterior tibial tendonitis is often seen after a sudden increase in activity or exercise, especially after an injury, or when an old case of posterior tibial tendonopathy is re-injured and thus becomes re-inflammed. It can also become inflammed due to the repetitive strain of poor biomechanics, flat feet, or improper shoe wear. In fact it is not uncommon for our podiatrists to find that even a small increase in daily walking in someone with a medially deviated STJ axis causes enough stress on the Posterior Tibial tendon to cause inflammation or degeneration. Arthritis and normal wear and tear can also cause some loss of elasticity in the fibers of the tendon, which can cause some discomfort during excessive physical activity. Symptoms of posterior tibial tendonitis include pain and swelling along the inside of the ankle and arch following the course of the tendon. In many cases, pain may be present when walking, exercising, or during extended periods of standing. If a tear is present in the posterior tibial tendon or if enough damage is done, pain may be present even at rest. Pain and swelling are signs of injury to the tendon. In some cases, the sheath or sleeve that surrounds the tendon will produce excessive amounts of lubricating fluid in an attempt to allow the tendon to glide easier during the healing process. This excessive fluid production results in the swelling the patient sees and feels on the inside of the ankle and arch. In acute cases, the injury to the tendon that started as tendonitis may progress to a full or partial tear of the tendon if not rested sufficiently. If Posterior tibial tendonitis does not heal properly and is not appropriately rehabilitated/treated, the discomfort may increase, and the disease may progress to dysfunction. Similiair to tendonitis, the pain associated with tendon dysfunction is localised along the course of the tendon around the inside of the ankle or along the inside of the arch. Treatment depends on how long the symptoms have been present and the cause of the tendonitis/tendinosis. Treatment must take into account the cause of the problem and whether or not the tendon is inflamed &/or degenerated, how much strength loss has occurred (if any) and if there are any signs of posterior tibial tendon dysfunction. Taking these factors into account, treatment modalities that may be advised include non-steroidal anti-inflammatory medication, strapping, bandaging, Achilles stretches (if required), rest, icing and orthotics. Custom made orthotics can help to support the arches of the feet and directly reduce the forces on the tendon to assist with healing. Orthotics may not always be needed. But where indicated, they may allow you to resume normal activities sooner. Such treatments are advised on a case by case basis, and as such, you may be advised to reduce all vigorous activities for several weeks to allow the inflammation and pain to subside and healing to take place. Your Podiatrist may also reduce your symptoms by limiting activity to control the pain and swelling. Stay off your feet a few days, then slowly increase your activity. Rest allows the tissues in your foot to heal. Rehabilitation exercises may be required in later stages when the tendonitis has progressed past inflammation or if tendinosis (long term degeneration) is present. Physical therapy treatments which our podiatrists can assist with include ultrasound, soft tissue massage, heat and strengthening exercises. The exercises given to you by your podiatrist help to strengthen the posterior tibial muscle and the small muscles within the feet (the intrinsics) to help support the arch. In more severe cases of inflammation or when tearing are present, an ultrasound may be required for further examination. Additional treatments such as a "moon boot" or a cast from the knee down may be utilized over four to six weeks to allow the tendon to completely rest and heal. If these measures fail to produce acceptable results, surgical intervention may be necessary to clean around the tendon and repair any defects. Surgical repair is more commonly needed when there is a progressive weakness and/or lengthening in the tendon such as that noted in Posterior tibial tendon dysfunction. Vary exercise routines. The variety will keep all groups of muscles from being under continuous strain.